Follow us on Instagram for the latest news! Joe completed his degree in spatial design at Massey University in Wellington, New Zealand. Welcome Joe! It's construction time in the city! Contractors are staying busy on projects in four boroughs and Yonkers, as well as several outside of the city this summer. Construction wrapped up this month on The Beekman Residences roof terrace, part of the redevelopment of the iconic Beekman Hotel in lower Manhattan. Residents can enjoy outdoor amenities and incredible views! Construction continues on our outdoor spaces at the new Panorama Development adjacent to Brooklyn Bridge Park. Stay tuned for updates! Steven Tupu spoke at the NY AIA’s Design For Aging event this month about terrain’s current design work for the Morningside Heights Housing Corporation, a naturally occurring retirement community (NORC). Terrain is redesigning the pathways and plazas on the 9 acre Manhattan middle income co-op community to provide safe and accessible space for seniors and outdoor play areas for new families. The Newswalk Condominium entrance plaza in Prospect Heights, Brooklyn opened to residents this summer. Custom precast concrete curbs and benches highlight the new design. The work follows up on a 15,000 sq. ft. roof terrace terrain designed at the building in 2009. Terrain participated in a landscape cleanup day with other volunteers at the Creston Avenue Residences in the Bronx. Terrain designed the landscape areas of the supportive housing building that also houses offices for Volunteers of America. Following the completion of his MLA from the University of Pennsylvania this spring, Cody Erhart joined terrain as a full-time designer. Cody brings years of experience in China to our New York studio. Welcome Cody! Check out Industry City Courtyard 5/6, now on Landezine! Maddie Clarke started her summer internship at terrain this week. Going into her fifth year at Ball State University, Maddie will focus on developing construction details this summer. Welcome Maddie! Terrain is excited to announce that we have won two New York ASLA awards this year! Industry City Courtyard 5/6 won an honor award and our residential terrace at One Grand Army Plaza took home a merit award. Neither would be possible without the talent and dedication of our consultant teams and skilled contractors. Congrats to all! Construction is progressing on the Salem Harbor Power Station and Park in Salem, Massachusetts this winter. The future public park was designed by terrain in collaboration with CookFox Architects. Look at those gabion walls! We are excited to announce that our public plaza at One Hudson Yards, directly below the Highline at West 30th Street, opened this fall. Go check it out the next time you stroll the Highline! Steven was happy share insight on risk-taking and activism within landscape architecture. Read it here. The rooftop at 53rd & 8th, a condominium property owned by HFZ Capital, is now open and in use by residents. Meanwhile on the ground, construction has commenced on the dog park and mural wall. Stay tuned! 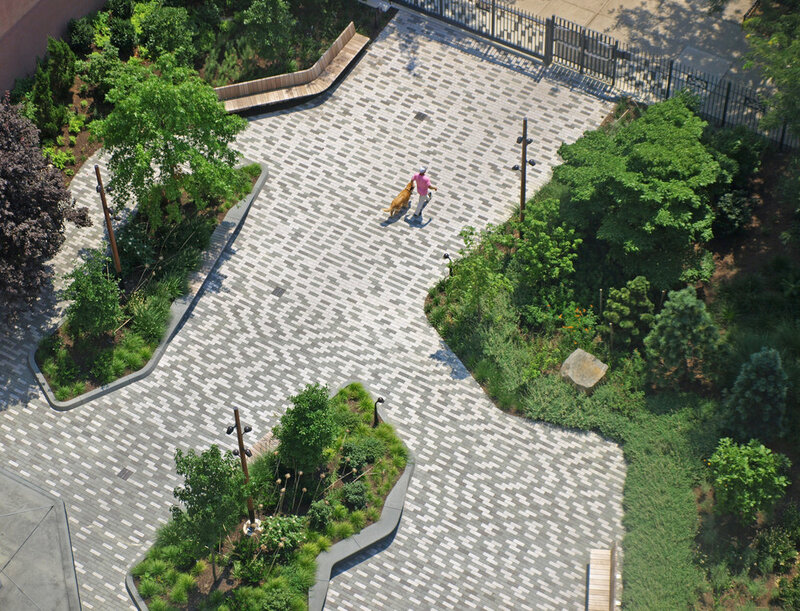 The archipelago courtyard at 560 State Street in Brooklyn is now featured on Landezine.com! Built in 2010, it features timber islands planted with Gleditsia floating in a plane of banded brick paving. Terrain is pleased to announce that our design for Related Company’s One Hudson Yards is under construction and scheduled for completion in Fall 2017. The design includes several rooftop terraces and a public plaza under the High Line at 30th Street. French design magazine Àvivre published our Printing Press Rooftop Park in Brooklyn as part of a series featuring rooftop parks and gardens from around the globe. Steven recently shared his design vision for Extell Development’s 555 10th Ave with the building marketing team. Nearly complete, terrain designed a 12th floor outdoor lounge and dog run and a pool deck on the 56th floor terrace. What a view! Construction is set to pick up on a number of housing projects throughout the Bronx this summer. At 4275 Park Avenue, the parking lot bio-swale and public terrace will be installed and planted in the coming months. And at 1060 Reverend James A. Polite Avenue, the pedestrian bridge is already in place, while contractors pour retaining walls and exposed aggregate pathways to link the upper and lower outdoor courtyards. In all, terrain will have seven projects under construction in the Bronx this summer. Residents of a new affordable housing building in Prospect Heights, Brooklyn are trialing their 1300 square foot community garden this summer. In collaboration with Cook + Fox Architects, terrain designed several rooftop terraces at 535 Carlton, including the 9th floor vegetable plot. Planted veggies include tomatoes, okra, lettuce, peppers, kale, eggplant, and so many more. Rebecca Lotka was quoted in Business Insider regarding the rise of rooftop farming at luxury condominiums in New York. Terrain, collaborating with architect Cook + Fox, designed a large productive rooftop garden at 550 Vanderbilt Ave in Brooklyn. The garden will be used to grow produce and herbs for Olmsted, a Prospect Heights restaurant founded by Chef Greg Baxtrom and Farmer Ian Rothman. Courtyard 5/6 at Industry City in Sunset Park is now open! The 600 foot long space features a woodland boardwalk, timber bleacher, and beer garden complete with a restored 1916 Adirondack fire tower. The Frying Pan of Pier 66 fame has expanded across the East River and opened the Wheelhouse, a seasonal bar and quick bite shop. Stop by to check it out! Steven Tupu spoke extensively with real estate publication Global Mansion about the state of planting design at luxury properties around the globe. Read it here. Terrain-NYC, in partnership with the Town of Tupper Lake, submitted schematic design proposals for two new parks near Tupper Lake, NY in the Adirondacks. The NYS Department of State also approved funding for the Flanders Performance Park, which is slated to go into construction later this year. Local fundraising efforts continue to make the Tupper Lake Master Plan a reality. The team arrives in Los Angeles to present at Green Build. The presentation, Farming the Fifth Facade: Designing Urban Food Production was well received. Check out the abstract here! Pictured below: Steven Tupu (Terrain), Gwen Schantz (Brooklyn Grange), and Susie Teal (Cook + Fox). Join Steven and the Cook + Fox team discuss biophilic design at the Los Angeles 2016 Green Build Conference. The event takes place from October 5-7th. The industrial courtyard over in Sunset Park, Brooklyn, is looking lush. A quick thanks to The Todd Group, an excellent contractor and partner. Head on over in late fall to enjoy the forest paths, turf and beer gardens. Residents of the Hegeman Residence, a LEED building designed by terrain & Cook + Fox Architects, banded together with a local non-profit and installed an extension to the main courtyard for growing vegetables and the opportunity to care for their own plants. We are so happy that the residents enjoy the gardens. 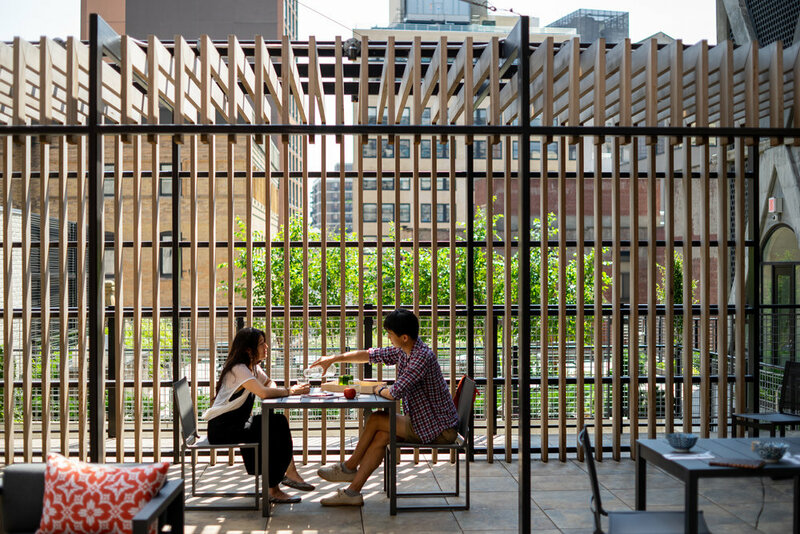 The terrace at 53rd & 8th is the first of 4 spaces designed by terrain for HFZ Capital. The entry landscape, roof deck, and dog run are to follow in late fall. Terrain designed a communal garden, rooftop and entry landscape in for a new senior home in Yonkers. The superstructure and site drainage is currently underway. The LEED building, designed by MAP Architecture & Planning, will provide an affordable home close to the amenities of downtown with its own green oasis on site. The 52 story tower is nearing completion along with a 10th floor Dog Run and 50th floor Pool Terrace and Sun Deck designed by Terrain. Plants are tagged and ready for a fall installation. Check back soon! 555ten. The Waterfront Park secured funding for a new performance structure, grading, paths and trees as the first step in the park's transformation. Please check back next spring for construction updates and details. Check out Terrain's newly completed Brooklyn Terrace on top of Richard Meyer's 1 Grand Army Plaza. The terrace overlooks the plaza, prospect park and the Manhattan Skyline! More photos available on the project page. See you in the fall - Updates to follow ! After much planning and anticipation, it's a year for building! Looking forward to sharing photos. Terrain nears completion on private terrace at 1 Grand Army Plaza. The design softens the terrace with lush planting, lit screens, children's area, and a raised perch to overlook Prospect Park. Photos coming soon! Terrain, in collaboration with Weintraub Diaz Landscape Architecture, receives 2016 Honor Award from New York Chapter of the American Society of Landscape Architects. Congratulations to MAP Architects! The recently completed, LEED Platinum, supportive housing building is being celebrated for it's livability, design, energy efficiency & more... Featured in Architect's Magazine. We are excited to welcome our new addition. Sam holds a BLA from Penn State University. Terrain's design for No Name Inlet at North Henry Street for the Newtown Creek Alliance was presented to the public and well received. The project is on track to receive federal and local funding. Furniture designer & model craftsman, Natch joins the crew. Plenty of model photos to come! Happy holidays from Terrain! We hope you enjoy the season, and will re-open in 2016! The village of Tupper Lake received nearly one-million dollars of state funding for the continued design, planning, construction documentation and early phasing of the 27 acre waterfront park! Terrain is ready to start! Check out the exhibit until February 7th, 2016. Congratulations to MAP Architecture for the decades of hard work and dedication towards a community driven rebuilding of the South Bronx! Read more here. Terrain moves to new location in SoHo. New office photo to follow soon- in the mean time grab your hard hat and dust mask! New Address: 203 Lafayette Street, 5th Floor, NY, NY 10012. Steven Tupu recieves great recepetion at the public presentation of Terrain's vision for a revitalized waterfront park to the Adirondack community of Tupper Lake & representatives from the New York Department of State! Thanks to the public for coming out, and thank you to all of our team members for the hard work. For more information on the project see our website or look to the local papers. Former Terrain employee, Meaghan, finds her way back after 7 years of teaching, leading her own practice and becoming a mom. Welcome back, Meaghan. Following design approval at Industry City, the team tapes out the proposal for the 600 foot long courtyard. Great exercise, great reality check before construction detailing, and great fun as always. Learn more about why we're so excited here. Long time collaborator & friend of Terrain, Maggie Condon, joins the office! Maggie brings with her over 20 years of experience and vast knowledge of durability and construction materials. Check out the construction updates at 11 Beach Street- a BKSK lead conversion of an 1882 built Tribeca building. It's gonna be an amazing roof terrace! Photo courtesy of Field Condition. Join Steven Tupu discuss the challenges and rewards of supportive housing landscapes with Cook Fox Architects, BKSK Architects, MAP Architects & Handel Architects. Thank you to MAP for catching this. A great day visiting earlier projects all across Long Island. Modern pools, tree houses, gardens, Montauk waves and Zum Scheider beers- not bad at all. Oh yeah, and tree-top table tennis! Terrain is excited to announce the arrival of our newest team member, Brian Green. Brian recently graduated from Virginia Tech's MLA program. Welcome! Footprint Power officially broke ground on a new combined cycle natural gas plant which replaces an old coal fired plant. The new plant is more efficient and occupies nearly 1/4 of the land area- leaving 7 acres of waterfront park available to the public for the first time in nearly a century. The Housing Collaborative & Volunteers of America celebrated the official completion of the Creston Avenue Residence, a new supportive housing building in the Fordham Heights neighborhood in the Bronx. The building houses over 70 individual and families in need, including those living with illnesses, Veterans and previously homeless individuals to whom a stable and affordable home is crucial to rebuilding their lives. Terrain is proud to be the landscape architect of an inviting rear courtyard which offers residents a place to gather, live closer to nature and call their own. Steven Tupu traveled back to his ancestral homeland in the Samoan Islands to work with the local village community to establish a native nursery which will supply coastal forest plantings in areas previously disturbed by logging. The restored forests will strengthen the island community's ability to withstand tropical storms. The project was made possible by U.S. Green Grants. The Hegeman Residence received the 2014 Housing Design Award from the Boston chapter of the AIA. Terrain designed the exterior spaces. Join Common Ground & a panel of architects at the center for architecture in a conversation on new supportive housing in New York City. Terrain's work will be presented with Cook & Fox Architects as well as MAP architects. Follow the link! Steven Tupu & the terrain team celebrate 10 years in business with some of our favorite people! A great night to start the next decade! Terrain secured a grant to improve the storm resiliency along the coast in Falelima, Samoa. The grant will fund the replanting of coastal forests and the establishment of a native tree nursery to supply future buffer plantings. Field trip to the pacific islands? Check! Crews are hard at work clearing, cleaning, capping & salvaging material at Footprint's Salem Harbor Station. Construction of phase 1 & development of phase 2 to follow! Terrain kicks off work on 4 large terraces at Jamaica Crossing with BRP Developers. Design work begins for St. Augustine's affordable and supportive housing. The site sits on a former church grounds with amazing geological schist exposed after demolition- we are very excited to be working on such a layered site for a good use! Welcome 2015! Looking forward to another great year. We are closing the office until January 5th, 2015. Have a wonderful break, and we'll see you next year! Greenland Forest City Partners break ground on 535 Carlton, a mixed income building designed by COOKFOX Architects. Terrain is tasked with designing the streetscape, building entries, and multiple levels of both private and common terraces. After recently earning a Masters in Landscape Architecture at Temple University, Rebecca joins Terrain full time. Dale brings with him decades of experience at leading firms in New York and around the country. Danny Forster Design Studio lead team members Terrain & ARUP in the design of a visitor's center and museum in the Seychelles. The team was awarded the second place prize for the unique and sustainable design. After 3 months as a Terrain team member, we celebrate our intern, Cissy Yang. Cissy is returning to the Rhode Island School of Design for her final year in a Masters of Landscape Architecture program. Steven heads up to the stunning Adirondacks to present Terrain's proposal for a waterfront park to the village officials and Department of State Representatives. Terrain joined up with Danny Forster Design Studio & ARUP to submit a proposal for the new Museum of Ethnography in Budapest, Hungary. The team's entry is among the top competition proposals. After gaining experience at several leading offices in New York City and becoming a mother, Liz rejoined Terrain. She previously worked at Terrain from 2007-2009. Steven traveled to Boston to attend the annual ASLA conference as well as UPenn's 100 Years of Landscape Architecture celebration. Steven previously taught design studios at the school. Terrain & COOKFOX Architects publicly present Footprint Power's proposal for the redevelopment of the Salem Harbor Power Station. The first phase of the proposal includes 7 acres of waterfront park designed by Terrain. Terrain & Studio Prospect head up to the Adirondacks to kickoff the masterplan of a waterfront park. The team met with the community and local officials to gather input and delve into the site. New Zealand native, Sylvia Wilson, joins Terrain, bringing with her an international sensibility to landscape. Sylvia interned with Terrain in 2011. Scott comes to Terrain with experience at a leading firm in New York and an interdisciplinary design office in Rome, Italy. Steven participated in a panel discussion on sustainable design and supportive housing with COOKFOX Architects & Common Ground. Terrain's work is featured in the book 'Rooftop Garden' by JTart Publishing, China 2013. Terrain celebrates the opening of the Hegeman Builing, a supportive and affordable housing project in Brownsville New York. Common Ground developed the project with COOKFOX Architects. Terrain designed the entry, courtyard and future community gardens. Terrain wins ASLA award for Sand's Point Residence in collaboration with Mark Dubois Architects. Friends of the Upper East Side Historic District awarded Terrain their restoration award for our work on Roosevelt Island. The Frog Terrace project wins a 2010 NY ASLA Merit Award. The project is exhibited at the Horticultural Society of New York. Terrain begins the coordination of phase 2 of the fresh water project in Falelima Village, Savaii, Samoa. Eerie Basin Park featured in 1000x Landscape Architecture, Braun Publising, 2009. The Folding Terrace project is the cover and feature article of the July 2009 issue of Landscape Architecture Magazine. Steven and Liz are invited critics at student reviews at RISD. Phase one of the fresh water project in Savaii, Samoa, is currently being implemented. Improvements include renovating the local school, adding bathroom facilities, and repairing rainwater catchment infrastructure. Phase one will double the water storing capacity of the school. The Terrain & COOKFOX winning entry for 'From the Ground Up: Innovative Green Homes' competition is on display at the Van Alen Institute. Terrain team member Meaghan Pierce accepts a teaching position at the Faculty of Architecture and Design at Victoria University in Wellington, NZ. The Magnolia Courtyard project in Brooklyn Heights receives a NY ASLA Merit Award in the residential category. The Unfolding Terrace Project in Dumbo Brookyln wins the national ASLA Honor Award for excellence in residential design. Terrain attended the awards ceremony in Philadelphia. The Eerie Basin Park, a Redhook, Brooklyn waterfront park in collaboration with Lee Weintraub, is featured on the cover of Landscape Architecture Magazine.